Sonker is an old-fashioned, juicy, fruity dessert made in Surry County and parts of Wilkes County, NC. 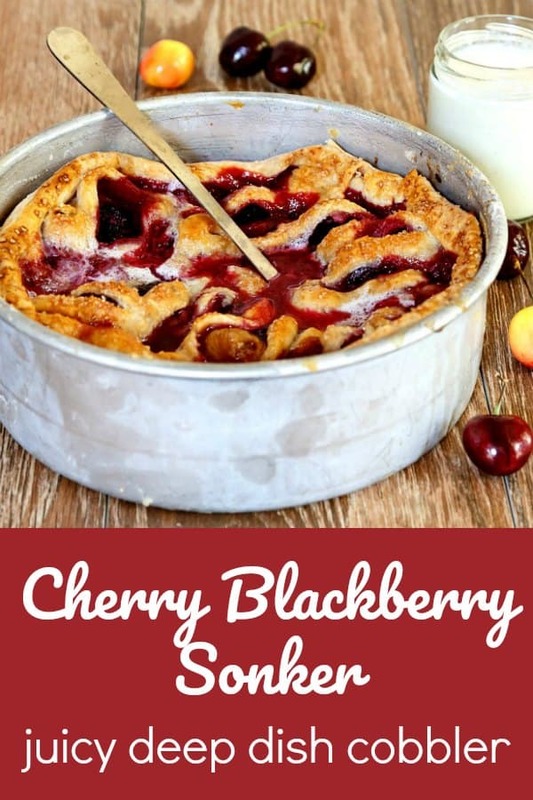 No two are made exactly the same way, and this cherry blackberry version is pretty excellent! This is the second sonker I’ve made for the blog. The first, strawberry peach with a lattice crust top, was really delicious, and now this blackberry cherry guy can keep it company! 2 Why Do They Call It Sonker? 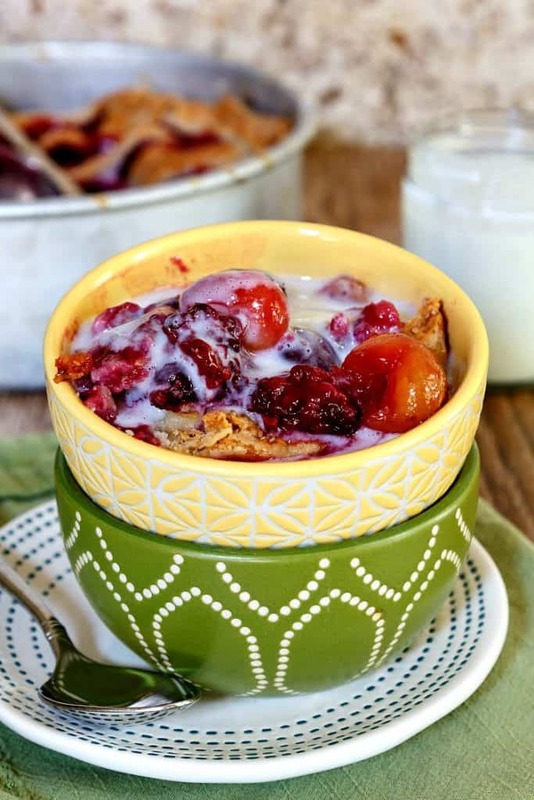 Sonker is one of the many fruit and batter quick desserts that come together quickly and make use of fruit that might be a little bit past its peak. Of course, all these desserts–cobblers, crisps, crumbles, buckles, slumps, pandowdy, sonker, grunts, and probably more–are only made better by using perfectly ripe fruit. While no two sonkers seem to be made exactly alike, there are a few characteristics that help to define them. Generally. Sonkers are made to feed a crowd. Sonkers are generally deep dish. Sonker, specifically the sweet potato kind, is often served with a starch-thickened sweetened milk sauce. The stuff is so good, I serve it with all the sonker I make, though! Why Do They Call It Sonker? I wish I knew. I’ve read some theories, but nobody seems to know for sure. I read in an article in Our State Magazine that the name could possibly be derived from the Scottish (?) word meaning “straw saddle.” Like maybe the sheet of dough over the top sort of looked like a homely saddle. If you squint at it. In the dark. Anyway, suffice to say sonker is the name. 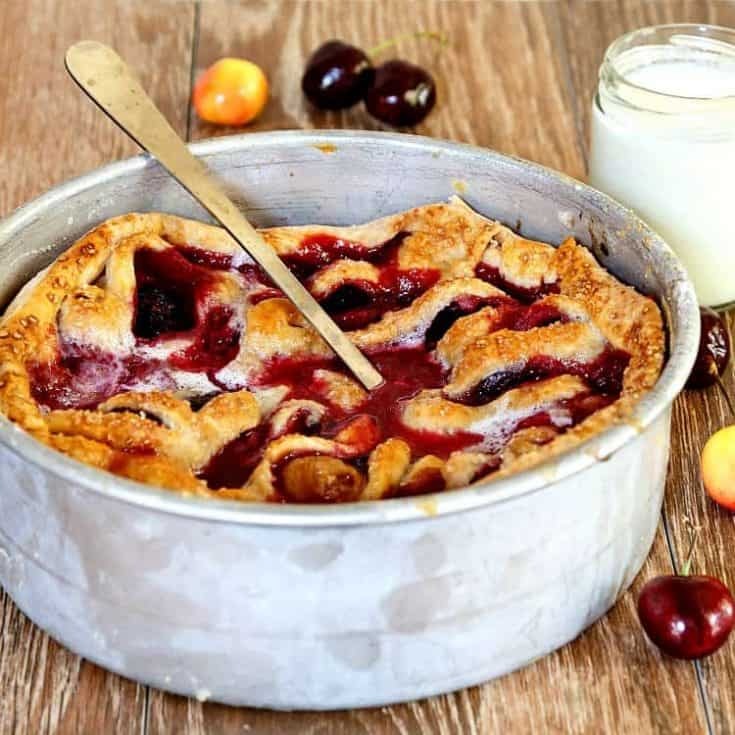 And if you come across a juicy, fruity dessert with a cake batter, pie crust, or biscuit filling and you happen to be in rural Surry or Wilkes Counties in North Carolina, chances are you have happened upon a sonker. No need to argue the finer points of etymology. Just dig in! Friends, I have been on The Sonker Trail, and I have eaten many types of sonker. I will write more extensively about that soon, but for now, here’s a list of the types of sonkers I’ve eaten. Super juicy with a biscuit crust on the sides and on the top. A little bit juicy with a batter poured on top and then baked. Deep dish, thickened juices with a lattice pie crust top. Stewed fruit with reduced juices and a batter top. Several of the people who served us sonker (in restaurants, bakeries, and one brewery) had never heard of the milk dip, although one person said they make their sweet potato sonker with milk in the mixture. Regardless, I’m all about the dip. Tastes like melted Philadelphia-style vanilla ice cream. That could never be a bad thing! As I hope I’ve made clear, no two sonkers are exactly alike. Their main unifying characteristic that makes a sonker a sonker is that they are made in Surry and/or Wilkes Counties in North Carolina. But if you’d like to know exactly how I made this one, here’s a little how-to for you. Mix filling ingredients together in a bowl and allow to sit for awhile to draw out the juices. 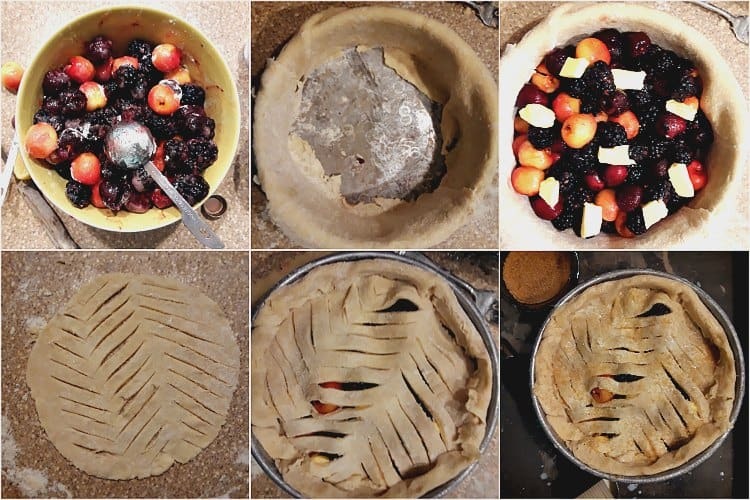 Line the sides of a deep (at least 2″) dish or pan with pie crust, allowing the excess to hang over the sides. Pour in the filling and the collected juices and dot with butter. Cut decorative slits into the top crust. Fit on top of the fruit and fold the excess dough from the sides over the top crust. Pour some of the dip over the partially baked sonker and bake until the juices are bubbling all over. To serve, pass extra dip. See the “white stuff” on top of some of the crust? That’s the dip, mostly baked in. It leaves a wonderful, sticky-sweet glaze on the crust. Now that you’ve seen the how to, let’s do this. If you like the sound of this sonker recipe, please consider rating and/or commenting. I really love hearing from you! And if you make it, and I hope you do, please share a photo on instagram tagging @onlinepastrychef and using #pcorecipe or share it in the Pastry Chef Online Facebook group. I can’t wait to see your version! 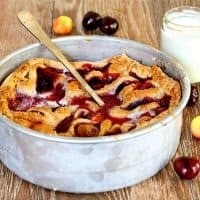 This sonker, a juicy, deep dish cobbler specific to Surry County, North Carolina, is bursting with summer berry flavor. 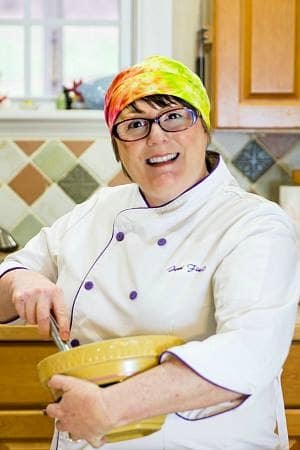 You will love the milk "dip" that goes with it, as well! Put the fruit, sugar, cornstarch or flour, lemon juice, salt, and nutmeg into a bowl. Toss to coat evenly. Allow to sit at room temperature for at least 30 minutes or up to 2 hours. Place a sheet pan on the center rack of your oven and preheat to 375F. Rub 1 Tablespoon of butter around the sides of a 8" or 9" deep cake pan (mine was 8" x 3". You can also do this in an 8" or 9" square baker. Roll out one piece of pie crust to about 3/8" thick. Cut into strips roughly 3" wide. Press the strips around the insides of the pan allowing any excess to fold over the edges of the pan. Roll out part of the other portion of dough into a circle (or square) about the same size as your pan (round or square). Cut slits in the dough--I cut mine into a herringbone pattern. Set aside for the moment. Pour the fruit and all the collected juiced into the prepared pan and spread out evenly. Cut the remaining 2 Tablespoons of butter into small pieces and scatter over the top of the fruit. Fit the top portion of dough on top of the fruit. Fold the excess of the bottom crust in over the top crust. No need to crimp. Brush the top of the sonker with egg wash and then sprinkle evenly with coarse sugar. I used Sugar in the Raw. Place on the sheet pan in the oven. After 30 minutes in the oven, pour about 1/2 of the hot dmilk dip (how to below) over the top of the sonker. Continue baking until well browned and until the fruit juices are bubbling all over, even in the center. This will take about 15 additional minutes. If the crust seems to be browning too much, tent loosely with foil. Cool to warm and serve, passing the dip. Stir together the milk, sugar, corn starch and salt in a medium saucepan. Cook over medium high heat, whisking frequently, until the mixture comes to a boil. Cook, whisking constantly, for 2 additional minutes, and remove from the heat. Stir in the vanilla. Use half the dip to pour over the sonker while it's in the oven. The rest is passed at the table for serving. Enjoy! And there you have it, friends. A little sonker history for your brain and some actual sonker for your tummy! I hope you enjoy every bite. Could frozen fruit be used in the Sonker? Gosh I love all of the fruit desserts in this category but you make the sonker look amazing! Maybe the best! But then you use blackberries and cherries, my faves!! This looks fantastic! 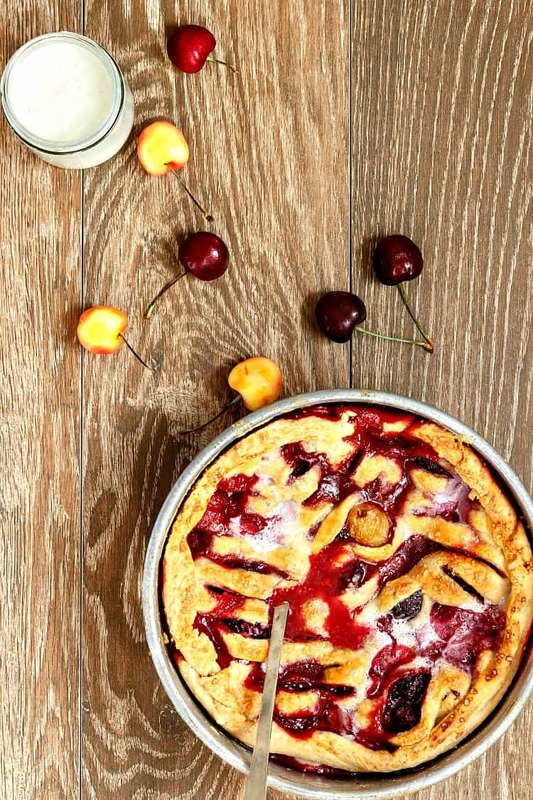 Perhaps you should take sonker across the pond–make it your own with your jams and fresh fruit all mixed in! Noms.